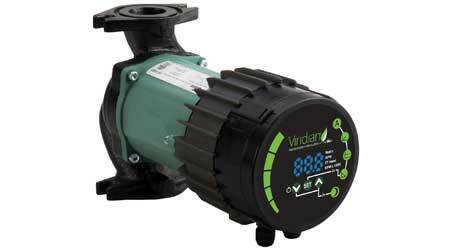 The expanded ECM, wet rotor Viridian line includes the VR3452 high efficiency wet rotor variable speed circulator for chilled and hot water applications, offering up to 34 feet of shut-off head and 52 gallons per minute flow. All settings are accomplished with the user-friendly interface. The permanent magnet ECM motor saves up to 85 percent of the electrical energy compared to conventional pumps. The circulator offers auto mode (default), and proportional pressure control, constant pressure control, constant speed and night setback turndown. The LED displays watts, flow and RPM. It’s available in 115 or 230 volts and has standard flanges and is for easy installation. The optional communication module provides: Ethernet and Modbus RTU communication, analog control input 0-10 volts, three analog inputs/outputs, one relay output, main and standby operation. The VR3452 also comes with an industry standard flange.